There are many tools available to help restaurant operators keep their storage areas organized. Accessories for this have become quite popular in commercial applications because an organized kitchen with well-thought out storage is a dream to work in and ultimately improves efficiencies all the way around. 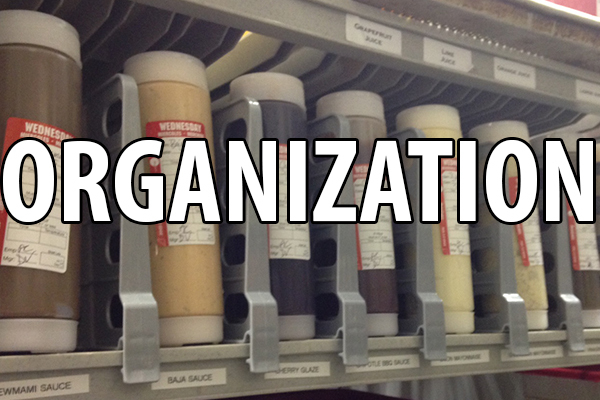 Disorganization can cause your staff to get sloppy which will eventually lead to improperly rotated food. This in turn leads to food waste, food spoilage that if consumed could make a customer sick. Also, when things get messy, it becomes a habit to just stack disorder over untidiness and that too could very well be taking up much needed space; making it difficult for your staff to locate items. When all the necessary ingredients and supplies are visible to your staff, within easy reach and ultimately in their proper place it makes prepping, cooking and cleaning easier. Cambro’s new Shelf Dividers are designed to be used with easy to clean, rust-free, Cambro Camshelving and Camshelving Elements to help keep stacked or narrow items such as vacuum sealed produce packages and condiment squeeze bottles from toppling over. These space-saver Shelf Dividers can also be used to keep linen, towels, disposables and janitorial supplies organized and easily accessible. A place for everything…and everything in its place. Yes, that is possible even in the busiest of commercial kitchens. Cambro Shelving + Shelving Accessories are designed to store all your food product and supplies to help support organization, labor savings and simplify inventory management no matter the environment or application.